Link building is still an important cornerstone in search engine optimization. By focusing on gaining trustworthy links, you can boost your website ranking and increase your visibility. There are some methods to building links that Google considers unethical and will penalize you. WPamplify, however, has 6 good ways to use link building for your small business website. Many businesses use blogs for sharing information and for marketing. Blogging is extremely helpful with search engine optimization because you add another page to index by Google and other search engines. By posting quality content to a business blog, you are more likely to generate backlinks from other websites without having to do additional work. Other sites that are backlinking to you are, in a sense, voting on your content as being worthwhile or important. For blogging, you can post about before-and-after projects, news within your industry, or maybe repurpose old content. You can also create content that may take a little more time to create, but can more likely increase the chances of getting backlinks from other sites. This type of content not only gives you a better chance of generating backlinks, but it also helps establish you and your company as an expert in your field. These can help answer questions, show examples of topics you discuss and can be shareable with others. Chances are that you’ve networked, intentionally or not, with colleagues, local businesses or organizations, even friends and family. This is a great opportunity to leverage these contacts when it comes to link building. If your contacts have their own websites, ask them if they’re interested in exchanging links with you. Reciprocal links, if done right, can help both you and your contact. You’re saying that your contact’s website offers great content and vice versa. There are other ways to leverage your partners and relationships. You can occasionally guest post to their blogs while leaving a link to your own website. You can also be a guest on their podcast if they have one. Plus, if you’ve used their product or service, they can place a testimonial written by you onto their website, with a link back to you. Is your business doing something newsworthy? Try reaching out to members of the local media to share your story with them. Attractive ideas could be anything from opening a new location in a certain part of town, to sponsoring a charity event or hosting a food or blood donation drive. The good news about your business has the added caveat of marketing your business offline, which can make a good impact on SEO. The end result may be having your story posted on the local news websites. Any mention of your business should earn a backlink to your site. A website’s resource page lists useful references and links. This is especially useful if you’re in a very populated area, or if you know a lot of people use your products. If you sell sporting goods, your resources page can list anything from local parks that are good for fishing to information about little league baseball. You can reach out to other businesses or brands who have their own resource page, and share an article, infographic, or other useful content that would be good for their page. In turn, you can also add their information or content onto your own page. Finding unlinked citations or mentions of your business is a cost-efficient way of link building. These are from other websites that discuss an industry-related topic, and bring up your name or business as a resource or reference. By finding these mentions, you’re already halfway to creating a new backlink. You can use tools such as BrandMentions or Google Alerts to find these mentions. If you find any articles with unlinked mentions of your business, get in touch with the author and ask if they can insert your link into the article. If done right, link building can give your small business website an extra push with your SEO efforts. It’s not as hard as you think if you use the methods listed above. 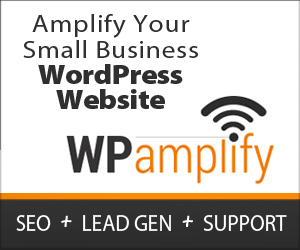 Contact WPamplify so we can get you started.